The Write-On™ tape dispensers make labeling easy and fast. Multiple colors and widths of labeling tape are readily positioned on a platform that provides a smooth surface for writing on each tape. When a tape is advanced and cut off on the serrated edge, a fresh length of label tape is positioned on the writing platform. The spindles are easily removed from the unit for loading and unloading tape and can be adjusted to hold either 25 or 75 mm (1 or 3") core diameter rolls. Included with each dispenser are three plastic separating discs, which when placed between the rolls assure smooth, snag free dispensing for up to four rolls of tape. Molded-in pen holder wells on the dispenser help to keep writing instruments handy. 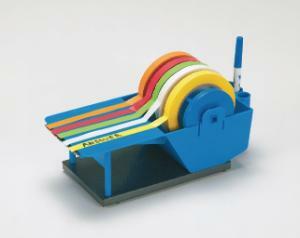 Ideal for use with the full line of Scienceware® Write-On™ Tapes which are available in 6 colors. The Write-On™ Benchtop Tape Dispenser has a plastic coated, weighted steel base with rubber feet to prevent slipping on the benchtop when pulling the labeling tape. The serrated cutting edge is steel for long term use.